NLSI’s David Kring and colleagues at the Center for Lunar Science and Exploration have combined images from the LRO camera with the LOLA altimetry data to create a fly around of the Aristarchus Plateau, Tycho and Orientale. The video is meant to provide an inspirational view of the lunar surface. This is an attractive brief view of the Moon with appropriately wistful and spacey music that will be a great conclusion to any public talk about the Moon. “From the Earth to the Moon” is a brief, but vivid video and audio recording that provides an inspirational view of the lunar surface, which humans have not visited since 1972, despite being the best and most accessible place in the solar system to explore the fundamental principles of our origins; Highlights vast portions of the lunar surface that have yet to be explored; and demonstrates how new images are revealing dramatic details of future landing sites suitable for both robotic and human missions. The scenes in the video are so dramatic that you may find yourself reaching out to pick up a rock and becoming restless to walk among the lunar peaks. We encourage you to download the HD version of the video (see link below) to fully marvel at this tour of the lunar surface. The beautiful lunar landscapes captured in the video include exposures of the lunar crust that will reveal, if sampled by future missions, the earliest processes associated with the formation of the Earth-Moon system, the evolution of the Moon through a period with a planet-wide magma ocean, and a subsequent period of intense bombardment that repeatedly modified the surfaces of the Earth, Moon, and all other inner solar system planets. That late period of heavy impact bombardment may have been triggered by a re-arrangement of outer solar system planets. Thus, the Moon is providing details of our own origins, the origins and evolution of all inner solar system planets, and the origin and evolution of outer solar system planets. Moreover, that period of bombardment immediately precedes the earliest isotopic evidence of life on Earth and, thus, may have been involved in the origin and early evolution of life on Earth. Previous missions explored only a tiny portion of the Moon. And current exploration of space from the International Space Station has left us trapped in low Earth orbit. To further understand the planet-altering processes described above and to further develop the technical capabilities needed to explore space, we need to return to the lunar surface. Let’s Never Stop Exploring. “From the Earth to the Moon” is produced from an integrated set of lunar images and topographical measurements. The video is not an animation sequence or artistic rendering of the Moon. Most of the images and topographical data were obtained by the NASA Lunar Reconnaissance Orbiter (LRO), in particular, the NASA Lunar Reconnaissance Orbiter Camera (LROC) and Lunar Orbiter Laser Altimeter (LOLA) teams, and rendered by ourselves, Robert Kooima at Louisiana State University, and the Goddard Space Flight Center Scientific Visualization Studio. 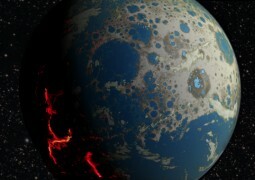 A new terrestrial bombardment model sheds light on the role asteroid collisions played in the evolution of early Earth. The Moon's magnetic field is 100 to 1000 times weaker than the Earth's.